My pastor recently decided to start blogging. The question then came up about how best to integrate this into the existing website and design. We could have added his blog to our existing WordPress based church web site but that would have added too much complexity to the site and more difficult to manage. Use WordPress blog – Signed him up for the a free WordPress blog but this could be any blogging software. FeedBurner used to consume the RSS feed from WordPress – I like to use FeedBurner to enforce a standard link name and format. 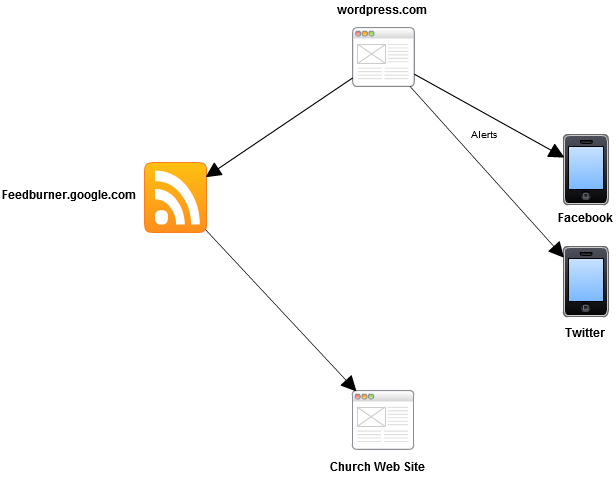 The standardized RSS feed would be consumed by the church web site – We can insert his RSS feed into any page or widget on the site. WordPress blog would be setup to send alerts to FaceBook and Twitter – This will allow everyone to know when he has posted to the blog. Church domain would have blog address added – I added a sub-domain in order for the blog and web site domains to be similar. I hate to tell you this but anyone can set this up, it is very easy!